Numerous studies have demonstrated that particulate matter can negatively impact human health. Particulate matter is any solid or liquid particle less than 100 microns in diameter that can be suspended in the atmosphere (Whalen et al. 2003). 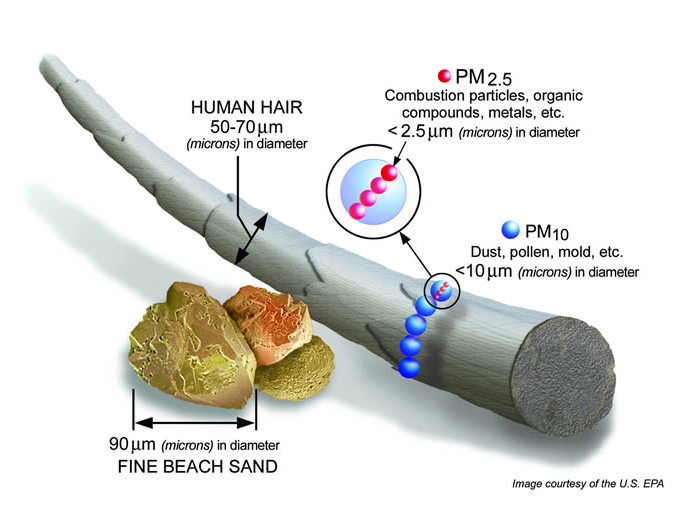 Particulate matter is often abbreviated as PM, followed by the size of the particle. For example, PM 2.5 refers to particulate matter with an aerodynamic diameter equal to or less than 2.5 microns in size. The figure on the right shows the relative size of PM 2.5. When regulating air quality to protect health, PM 10 and PM 2.5 are the particle sizes of greatest concern. These small particles have the potential to travel longer distances than larger particles, and are more difficult for the body's defenses to filter. Of these, PM2.5 has the greatest potential to affect human health. Because of their small size PM 2.5 can be drawn deep into the lungs upon inhalation. Approximately 70% of all particulates emitted by biomass burning are less than 2.5 microns in diameter. Exposure to high concentrations of PM 2.5 can have both short and long term effects which are listed in the table below. PM 2.5 is classified as a "criteria pollutant" by the Environmental Protection Agency. Among other things, this designation means that standards for PM 2.5 are put forth to protect the population, including its most sensitive members, with an adequate margin of safety. More information about this designation and what it means will be presented in Module 2. Short term effects include increased respiratory impacts (i.e. shortness of breath and coughing), changes in heart rate variability, and irregular heart beat among others. Long term effects include reduced lung function, chronic lung disease in children, and premature death in people with heart and lung disease. More information about particulate matter pollution is available from the EPA on their particle pollution webpage. Hardy, Colin C.; Ottmar, Roger D.; Peterson, Janice L.; Core, John E.; Seamon, Paula. 2001. Smoke management guide for prescribed and wildland fire, 2001 edition. PMS 420-2. National Wildfire Coordination Group, National Interagency Fire Center. Boise, Idaho. 226 pp.